It seems that for at least 15 years, Zabar’s, the Upper West Side grocery with the big crowds and even bigger prices, sold that as lobster salad — thousands and thousands of pounds of it, by itself in a plastic tub or on a bagel or a roll. Apparently no one noticed. Then Doug MacCash, a reporter from The Times-Picayune of New Orleans, stopped at Zabar’s while vacationing in Manhattan last month. He checked the label. “Wild fresh water crayfish?” he wrote. “Really? At $16.95 per pound?” He photographed the label, just to be sure. Mr. MacCash had discovered a fact of New York culinary life that New Yorkers had not: There was no lobster in the lobster salad at Zabar’s. Fast-forward and interesting to note, that owner Saul Zabar then took measures to rename their bogus salad as: Seafarer Salad. But Mr. Zabar himself admits this particular title was once used for a Zabar's salad made of that spongy-tasting stuff we all know as "copy crab." You know, that awful "fish gum" made of chopped pollack and cornstarch (and possibly a dab or two of Elmer's glue), pressed together to dupe folks into thinking they're eating real, bona fide, "crabmeat." The main ingredient remains the same: wild freshwater crawfish. 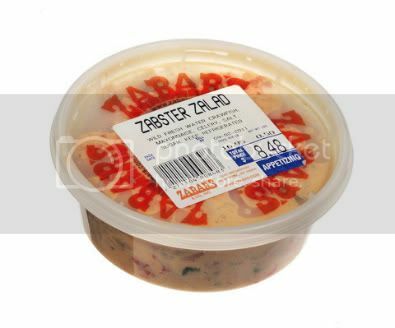 Like the lobsterless lobster salad before it, “zabster zalad” also contains mayonnaise, celery, salt and sugar. And for the record, he pronounced “zabster” to rhyme with Napster, the music-sharing service, not the ingredient that his lobster salad never had. Gotta tell you, $16.95 per pound for "zabster"? Thanks, Mr. Zabar, but I think I'll pass.